PHYSAN 20 is a broad range disinfectant which effectively controls a wide variety of pathogens on hard surfaces and plants. Its applications include greenhouses; hard surfaces; lawn and turfgrass; seedlings and cut flowers; decorative fountains, pools and birdbaths; and plants. 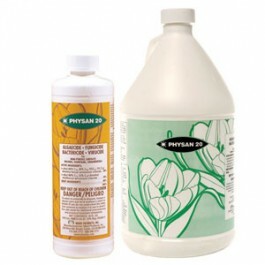 PHYSAN 20 is an EPA approved concentrate formulated with unique agents to provide overall protection for your plants and greenhouses. PHYSAN 20 poses no human or environmental risk when it is used at recommended use levels and according to label instructions. PHYSAN 20 controls infectious-spreading organisms which can be carried from plant to plant by using contaminated pots, flats, seed beds, soil, tools and human hands. A synergistic blend of two quaternary ammonium compounds.